From left to right: Luci the Demon, Princess Bean, and Elfo the elf. Even though Disenchantment is perfectly able to stand on its own based solely on its premise, Netflix has done the world a solid and dropped two sizzle reels featuring some of the series’ core characters who really sell the show. 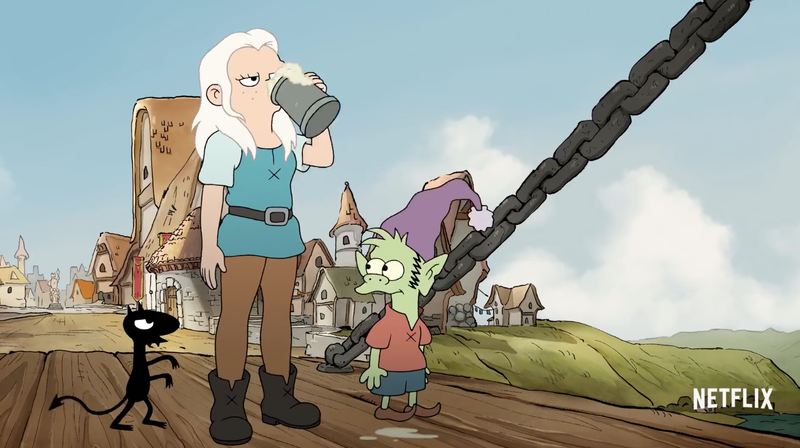 Even though Princess Bean’s hard-boozing habits might not resonate with all of Disenchantment’s audience, you’ve got to hand it to Netflix for leading with the reality of the show. Bean’s tough, sure, but she’s just out here trying to get by like the rest of us. Disenchantment, starring Broad City’s Abbi Jacobson and voiceover mainstays like John DiMaggio and Maurice LaMarche, premieres on August 17.